So the build up continues and we all wish the water to fall from the sky, but the suspense will continue. Luckily to make up for the hot and humid sweaty wait, almost everything is season in the veggie gardens of the top end- OK the cucumbers and tomatoes may be suffering a little, but they are hanging on and the watermelons are here, and what is nearly as refreshing as putting your head into the freezer a little is wonderful sweet juicy watermelons combined with other delicious bits and pieces! I was inspired to write this after seeing my friend Sophie write about a curious watermelon and cider vinegar tonic, on her blog The Invisible Cook. Watermelon can be used in many ways. Of course it can be cut into huge chunks, and enjoyed with a hard day working in the heat or made into funky salads. 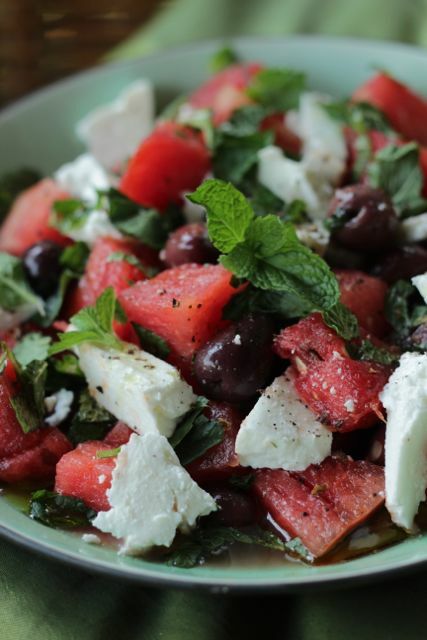 The salad below is a watermelon salad, with feta, local mint and Australian kalamata olives. Just add a drizzle of olive oil, a squeeze of lime juice and a grind of black pepper. So easy and delicious. I f you want to add some grains I reckon some Australian quinoa or couscous would go down a treat, lightly mixed through! The cheese in this picture is local and amazing buffalo ricotta, which is not being produced right now, but any soft white cheese like feta, or halloumi would be amazing, and of course better if at least it is Australian so it has travelled less distance, which also goes for the olives. Watermelons are only in season this time of year and need to be grown from the beginning of the dry season to get nice and big ones, they grow along the ground and are best planted on mounds and fed with organic fertiliser, like seaweed solution, cow and chicken manure mixtures and watered well and be in full sun. 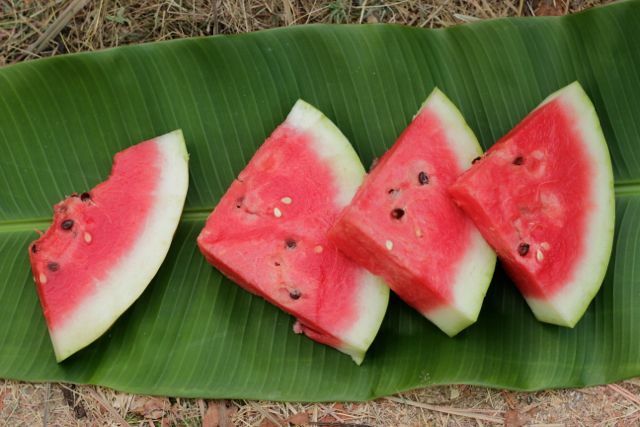 When the watermelon is ripening it is best to lift it off hard ground and put hay under the fruit. You can harvest the fruit, when the underside starts to go yellow, you can tap the fruit and if it sounds hollow it is ready. Try not to let them ripen too much or they will go flowery inside. The fruit and the rind is rich in vitamin A and D, and the fruit can be made into great salads and juices, but the rind, the white part between the green skin and the red flesh, can also be cooked into soups and curries- so save it too. If you haven’t grown any this year, many are sold at the side of the road around Darwin and are from rural farms and I have seen them in Nightcliff 5 star at $1.29 kg- so that is around $9 for one giant watermelon!